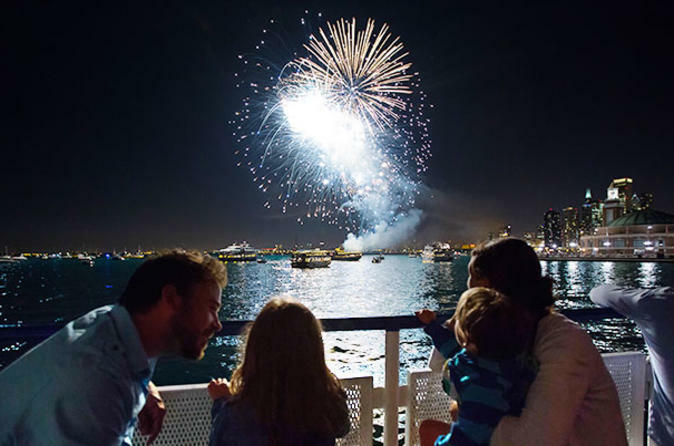 On Wednesday and Saturday evenings in the summer, admire all of Chicago's fabulous lakefront sights and attractions on this 60-minute Lake Michigan boat tour, which ends with a spectacular view of the Navy Pier's glittering fireworks display. Cruise along Lake Michigan and take in amazing views of the city’s famous skyscrapers and famous fireworks from a great vantage point. Enjoy drinks from the onboard bar as you relax on this sightseeing fireworks cruise. Your tour begins with a 40 minute sightseeing cruise on Lake Michigan, where you'll marvel at all of Chicago's fabulous lakefront sights. On this boat tour, your guide will tell you about Chicago's colorful history and famous landmarks as you enjoy the panorama of Chicago's famous skyline. See Chicago's major skyscrapers like the John Hancock Center, Aon, Trump Tower, Willis Tower (Sears Tower) and more. Spot downtown areas like the Gold Coast, Streeterville, Grant Park and Buckingham Fountain. Your tour concludes with a fantastic view of the Navy Pier fireworks display. Feel free to purchase beverages at the on-board bar (cash only). This is a perfect way for the entire family to experience Chicago's beautiful lakefront! This cruise is seasonal and operates in the summer only.